Adding a sunroom to your home can transform your summer. In fact, it can make every coming season better from now on. It could even increase your Northern Virginia home’s value. A new sunroom gives you more options for summer relaxing and entertaining than ever before. With a custom sunroom for your home in Virginia or West Virginia, you could enjoy all of this, this summer. Tired of sitting in the living room for TV night, but it’s too hot for a picnic in the park? You can do either, comfortably, in your sunroom. You can enjoy the outdoors and family togetherness without leaving creature comforts. You can play board games with the family, screen a movie, or simply eat dinner in a place that’s more fun than the dining room. (And it’s free from insects, unlike the park.) As a kid’s playroom, the sunroom can’t be beat. Sunrooms offer a unique, natural setting that can bring new freshness and new options for family time. Throw the best summer birthday party or a neighborhood get-together with little effort needed. Your sunroom setting alone can make even the most casual, spur-of-the-moment summer event magical. Sunroom entertaining is easy and comfortable, whether you go all out or simply pull together a BYOB. This unique celebration spot, which brings nature right into your home, is perfect for any occasion. Your sunroom can be like a cool mini-vacation every time you step into it. Consider having a nice breakfast in your sunroom to start the day. Arrange a generously sized, comfortable chair next to a tea table. Grab a book (and maybe a snack) to enjoy a peaceful, calm afternoon. If you prefer an evening of quiet reflection, that’s no problem. Simply adjust your custom sunroom lighting feature. Raise or lower the blinds with your remote, and set your ideal temperature with selected features. Porch swings have nothing on a sunroom for sweethearts. Watch the sunset together over a glass of wine, any day of the week. A sunroom addition can be a convenient couple’s getaway or hideaway. This space offers many options for keeping the romance in any relationship. 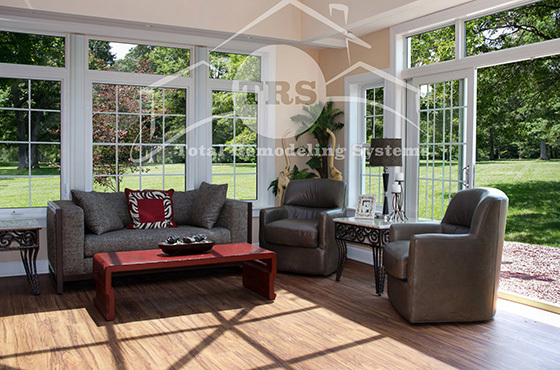 Your sunroom options are endless with the team at Total Remodeling Systems. You can opt for a fully featured sunroom, with sound system, UV protective glass, and advanced mist cooling. If you prefer, we can build a simple, rustic, enclosed porch version for your sunroom. Or, we can provide you a little of both. We’ll create the sunroom of your dreams, offering all kinds of design and functionality options to unleash your creativity. A sunroom built by TRS is one of the most cost-effective home additions to consider, with the most streamlined construction process. When you choose an experienced sunroom contractor, you’ll have a world of design options and custom features to choose from. Our experience means that your project is completed quickly, on budget, with little disruption to your household routine. Our commitment to customer satisfaction means you’ll enjoy your sunroom for decades to come. If you’ve been considering a new custom sunroom for your home, now is the time to build it. With all the benefits you’ll enjoy, you’ll wonder, “Why did I wait so long to build my sunroom?” At TRS, we’re happy to offer more information about sunroom home additions. Contact Total Remodeling Systems by calling ​1-877-309-8445 to get started on your new sunroom in Northern Virginia or West Virginia today!